This house is located on a secluded lot which features exposed rock ledges and some dramatic topography. The mass of the house is characterized by wings that project into the landscape creating a series of exterior spaces, which correspond to the rooms within. The asymmetrical disposition responds to the topography and to the winding approach from the street. 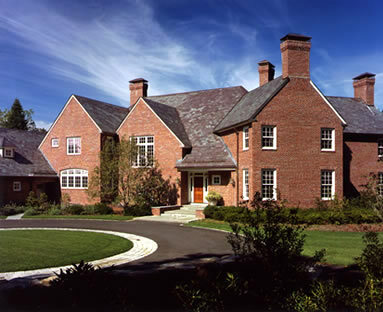 The exterior brick and the slate roofing were selected for their subtle color and texture, and for their durability. Inside, the formal rooms are arranged around the entry hall and feature extensive millwork and cabinetry. Beyond the kitchen and the service rooms there is an indoor pool with a glazed bay at the end overlooking a terraced garden and the woods outside.